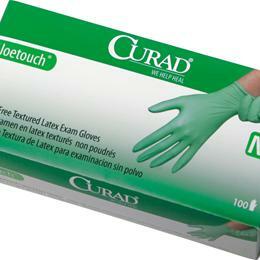 Curad Aloetouch Pf Latex Exam Gloves: Curad Aloetouch Latex Exam Gloves Are Coated With Aloe Vera Which Naturally Helps Moisturize And Soothe Dry Hands. These Strong, Durable, Natural Rubber Latex Gloves Offer Superior Barrier Protection And Are Powder-Free To Minimize Skin Irritation. The Fully Textured Surface Provides A Sure Grip On Instruments And Dressings. These Gloves Are Ideal For Anyone Who Changes Gloves Frequently, Washes Hands Repeatedly, Or Wears Gloves For Extended Periods Of Time. Extra-Large.